Palm Grove Gardens is actually a private property but its owner, Sir David Gibbons, graciously opens it for members of the public to enjoy. Sir David is a former Premier and a member of the prominent Gibbons family, owners of the companies such as Capital G and the Gibbons Company department store. As its name suggests the large garden is home to a variety of palms. Throughout the grounds you will see endemic Bermuda palmettos and invasive species such as European fan, Fiji and Cuban royal palms. You will also see a delightful wishing well, a romantic moongate and an aviary housing parrots and toucans. 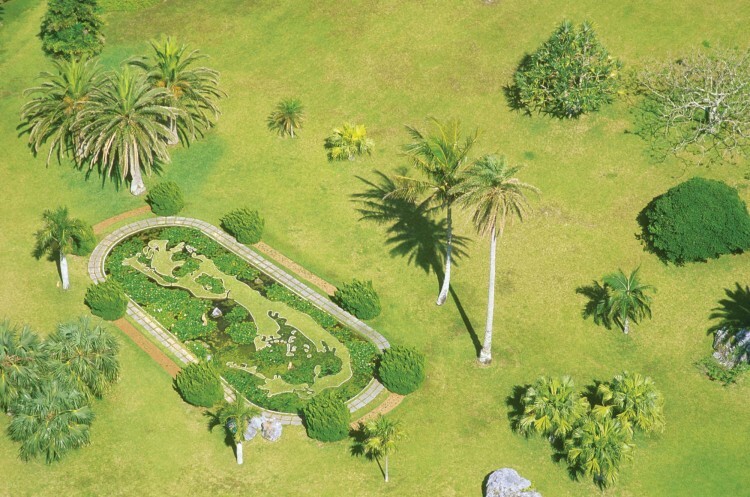 The garden however, is most noted for its unique pond which features a grassy relief of Bermuda at its centre. You can also wander down to the rocky shoreline. To your right there’s the Ariel Sands hotel (now closed). Look out to the ocean and you’ll see a sculpture of Ariel rising out of the wave. It was created by American artist Seward Johnson, a cousin of actor Michael Douglas, one of the hotel’s owners. Palm Grove Gardens is open to the public Monday to Thursday only, from 9 am to 5 pm. There is no admission fee. Please bear in mind while visiting that the house is a private family home. Palm Grove Garden is located on the South Road in Devonshire Parish. From Hamilton it is the next turning on the right after the entrance to the Ariel Sands hotel. Bus number 1 runs between Hamilton and St George, and stops outside the property. Map showing location of Palm Grove Gardens. It’s a credit to the Gibbons family and their friendliness that they allow the general public to view their gardens for free. I’ve been coming to Bermuda for many years and they’ve been open for as long as I can remember. You can literally go anywhere (apart from in the house – never tried) and nobody bothers you. The gardens are huge. The first time I went I thought the gardens were just the area in front of the house. I never ventured behind the house. What a mistake! Most of the gardens are behind the house. You can go right down to the coast! Do not miss this place. If it ever changes ownership, the next owners might not be so generous. I visited the Gardens in 1971 with my parents as a child. Now that I am fortunate to live here, I had the pleasure of introducing my husband, who has lived here for nearly 30 years, to Palm Grove for the first time during Easter week in 2009, taking photos in the same place I did all those years ago with my mother and father. Thank you to Sir David and your family. I now recommend the Gardens as a must see to all the guests and owners I meet at The Reefs Club! I just want to let Sir David Gibbons and his family know how much I appreciate the graciousness of their opening their property to the public. 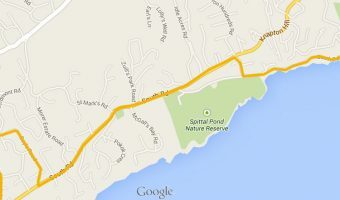 I’ve lived in Bermuda since 2003 and kept meaning to visit ( I live in Hamilton Parish. It’s not like I’m out in one of the western parishes.). I finally did in spring 2010 and have gone a couple of times since. It is such an oasis and lovely respite from everyday life. I feel it be a slice of "old Bermuda". Anyhow, I just want to extend my heartfelt thanks for your generosity. Wonderful gardens and well worth a visit. I have been to them many times, both when I lived on the island and on return visits. Always lovely and great for visitors! Video showing the private gardens of Sir David Gibbons. 22-acre park home to a fantastic collection of trees and shrubs from all over the world.